It's Friday! Today brings us a look at the 2nd of the 2 newest Transformers Prime - Beast Hunters voyager scale figures, the leader of the new Predacon faction, Predaking! Predaking and his Predacons are the newest additions to the TF:Prime universe. Created by Shockwave, the Predacons join in the hunt with the Decepticons to destroy the Autobots once and for all. Does this new Predaking deserve his namesake? Take a peek after the jump. According to the newest information on the Predacons, they were a faction of unaligned transformers long thought to be extinct. The Decepticon 'mad' scientist, Shockwave, has managed to resurrect this long lost, brutal Transformers sub-type and put it to use. Predaking, based on name alone, is the leader of this resurrected faction. He and his Predacons are now Megatron's greatest weapon against the Autobots. Until we actually see how Transformers: Prime season 3 plays out, who knows what will happen. Predaking comes to us in the standard TF:Prime packaging of a primarily white box with the TF:Prime and Beast Hunters logos. As with all the Beast Hunters sub-line, we get a character shot of Predaking on the left side of the box. All of the figures for Beast Hunters have this pic, luckily for Predaking, it just happens to be a shot of himself. The front also gives us a Beast-mode shot of Predaking with a note that he includes "Twin Hyrdafire Blasters". The sides of the box give us some nice character art, a down and dirty bio, and a Tech-Spec. The back gives us the usual shots of Predaking in both Bot and Beast modes. We get a few notes on the figure and another notification of his weapons. Free Predaking from his plastic cell and we find the normal paper ties and plastic tray, laid into a card tray with instructions nicely folded behind. The accessories laid into the tray for Predaking are his sword, which part of his Beast-mode tail and his Hydrafire Blasters. The sword itself is pretty simple. The Hydrafire Blasters have a nice little mechanism. There is a lever on them that when pressed, extends the blaster and straightens it out, a little more pressure, and the missile fires. The instruction booklet also gives us some neat fluff on the Hydrafire Blasters... semi-sentient weapons that lock onto their targets and have a power level consummate to Predaking's rage. Apparently, Predaking is not only a transformer, but a Super Saiyan. POWER LEVEL ONE MILLION! I started off by figuring out how to get Predaking into Beast-mode and I have to say, I do like the way he looks. The Hydrafire Blasters fit into 2 post holes on either side of the Beast-mode head. They don't have much in the way of articulation, but I do like the look. Predaking is molded primarily in black and orange with some silver/grey thrown in. Throughout the figure are Cybertronian glyphs molded into various parts, namely the wings and lower dragon body. Unsurprisingly, the Beast-mode's articulation is limited. The hind legs will mainly be bent for a standing stance or extended. The forelegs, being the Bot-mode arms have a little more range of motion, but not much. The wings are on 3 separate joints, all hinges, so they don't do more than fan out or swing in one direction. 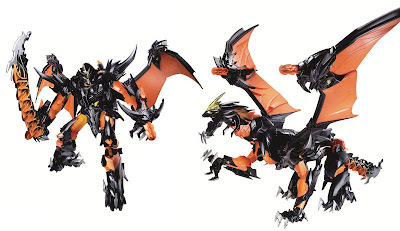 None-the-less... Predaking's Beast-mode does look good. Predaking's main Beast-mode head has an opening and closing jaw. The Hydrafire Blaster head mouths also open and close. They are on a spring and have a tendency to stay closed. He does look good. I think if the Hydrafire Blaster heads had a little more articulation it would make a good Beast-mode, great. So... starting in Beast-mode, remove the accessories... the Hydrafire Blasters and sword/tail. Pop the center body halves apart, these will form the Bot-mode legs. Unfold and rotate them around so the hollows in the calves face up. The Beast-mode legs rotate around and then seat in to the hollows on the back of each leg. The small grey claws rotate back to become the heels. The claws themselves are only hinged once and with the Beast-mode legs folded up, the 'heels' will not be symmetrical; one set will point up and the other, down. The remaining tail section of the Beast-mode will come into play later. With the legs "done", swing the wings back down and outward. Predaking's forelegs become his arms. Simply fold the feet together to form the hands, swing the arms down, and fold out the large black spiky bits to cap off the shoulders. To finalize the transformation, open Predaking's chest; the Bot head is in here. The Beast head and Bot head are connected, rotating the Bot head out swings the Beast head back. Close the chest. Rotate the Beast head to face down. There is a hollow in Predaking's back that the Beast head curls up into. The tail section rotates so the spiky-bits face outward and then folds upwards to cover the back of the Beast head. I took some liberty with folding the wings in a little further to the body instead of leaving them hanging further out as per the instructions. Predaking has a good look to him. The paint-apps on mine are fairly clean. The box shows that the figure has black apps along his wings yet the toy does not... final product may vary. The orange and black certainly pay homage to G1 Predaking. To further that homage, more gold and some yellow would have been excellent choices. Being a new mold Predaking has quite a bit or articulation. Plenty of ball joints with multi-swivel and hinge joints to give you some display options. The sword handle has a post that fits into place via a slot in Predaking's hand. The Hydrafire Blasters have posts on them that fit into ports on the back of Predaking's wrists. They are also contoured in a way that they match the molding of his hands. Both Hydrafire Blasters have a half of a wheeled mechanism that can be made whole by positioning Predaking's arms just so. The two posts meet together allowing both Blasters to be fired by using only one trigger mechanism. I tried putting ALL is bits on him... he can't really hold the sword well with the Blasters in place. But the sword looks even goofier protruding from the tail end on his back. So far, the only other Predacon I had to put in a pic with Predaking was Legion scale Twinstrike. Lazerback and Ripclaw will be in my possession soon enough. I've made a decision to only purchase the Predacons and cast characters and to not purchase any of the Beast Hunter characters that are not first runs versions. I really don't like the look of the spiky Autobots or Decepticons. Smokescreen and Shockwave are the only two coming up, that I will be purchasing. All in all, I like Predaking as a figure; he looks good in either mode. I guess my only real complaint is that while he is a of a decent size, based on what I've seen from the show, he should be a lot bigger. I know there is a leader version... or what is being called an "Ultimate" version... in the works. He looks much more accurate to what I've seen and I'm sure his scale will be much closer to what it should be. I will more than likely upgrade my Predaking to the Ultimate version and stow or sell this one once it becomes available. The Voyager scale Predaking is making the rounds right now packed with Beast Hunters Optimus Prime. Both are packed 2 per case, so it should not be hard to obtain one of either. Pics, words, and DragonBall Z reference by Scion of Primus.